Greg Carvel is not gregarious, but he is a man of action. Minutes after taking the UMass job in the late spring of 2016, Carvel picked up the phone and spoke live to Gary Makar, Cale’s father. He made his case for Cale to proceed with “plan A,” to come to Amherst and continue his development. Carvel pointed out that he had helped develop NHL All-Star defenseman Erik Karlsson during his first two years in Ottawa, and the old man was sold. Carvel had his superstar, and coach and player proceed to march in lockstep, dramatically turning around the UMass hockey program in two seasons. Every camera shot of Carvel during the NCAA Northeast Regionals showed him under control, siccing his Minutemen on the Harvard and Notre Dame defenders. Carvel was the ultimate poker player, revealing little emotion while playing trump card Makar whenever necessary. Carvel finally came out of his emotional armor when sophomore Oliver Chau put the empty net dagger into Notre Dame, clinching UMass’ first ever trip to the Frozen Four. Smiling at last, Carvel gave his little forward a hug and ruffled Chau’s hair on the bench. The stern taskmaster was a kid again, celebrating with his buds in the backyard rink, imagining a championship run. Only this was no dream. 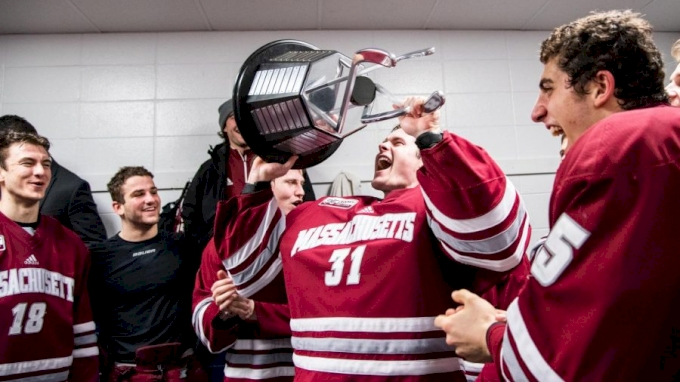 UMass hockey doubters had plenty to work with leading up to the NCAA regionals. The Minutemen stumbled in their Hockey East quarterfinal opener against No. 8 seed UNH, being forced into double overtime. The next weekend, UMass was snuffed out of the HE semifinals by No. 7 Boston College. A large contingent of UMass alums spent the afternoon sitting on their hands at Boston Garden. Carvel was desperate to right the ship. Flying indeed. Two years removed from a five-win season [not a misprint! ], Carvel and Makar have helped vault UMass into the rarified air of the Frozen Four. Barring a travesty, this duo will take care of some additional business in Buffalo—the 2019 Hobey Baker Award. That, too, will be a first in UMass history. Makar’s brilliant season prompts memories of other Hockey East legends—Jack Eichel (BU, 2015) and Paul Kariya (Maine, 1993)—Hobey Baker Award winners who carried their respective teams to the NCAA Championship game. Resurgent UMass also has an X-factor in its bid for history, something Carvel refers to as a “sleeping giant.” That’s the prodigious UMass alumnae fan base, represented by the 5,000-plus fans that showed up in full force at the regional in Manchester, New Hampshire, loud and proud in their crimson and white. No one jumped off the Minuteman bandwagon after the flat tire in Boston. Fan support is tangential compared to the players in the room, one in particular. It is the dynamic Makar who will try and forge his legend, and his team’s, in Buffalo.